Hubby and I spent all last week in Atlanta buying for the Shoppe, so I slated the bedroom makeover from our Farmhouse on Main to post during our absence. 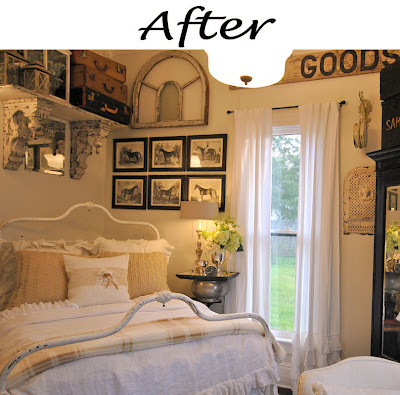 When we returned home, I was surprised by the near 100 comments and totally blown away by the Pinterest action our little farmhouse bedroom was getting! My Pinterest following jumped significantly almost overnight. Thank you so much for that, you overwhelm me! If you've not checked out Pinterest yet, you can find me here. 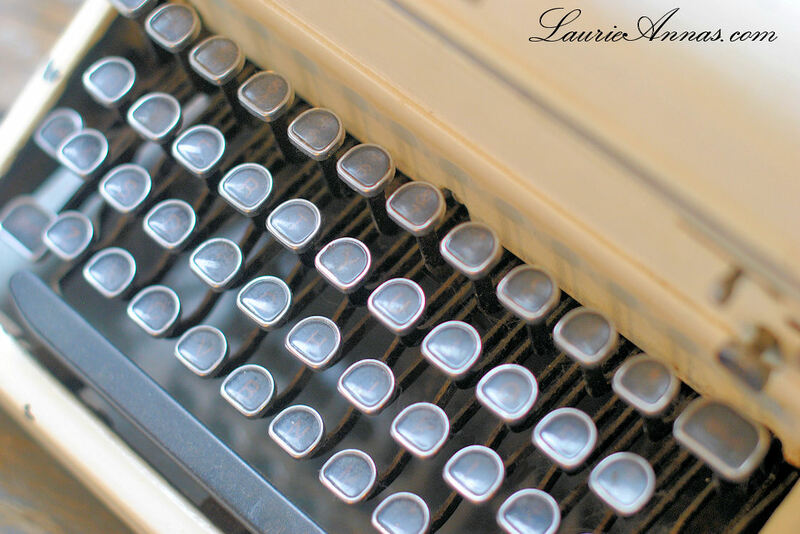 My blog is very special and personal for me. And, even though it is loosely attached to my business, it's so much more than that to me. It's a way for us to share and connect with each other. Your thoughtful words, and your willingness to share them through comments and emails, brings me so much joy. 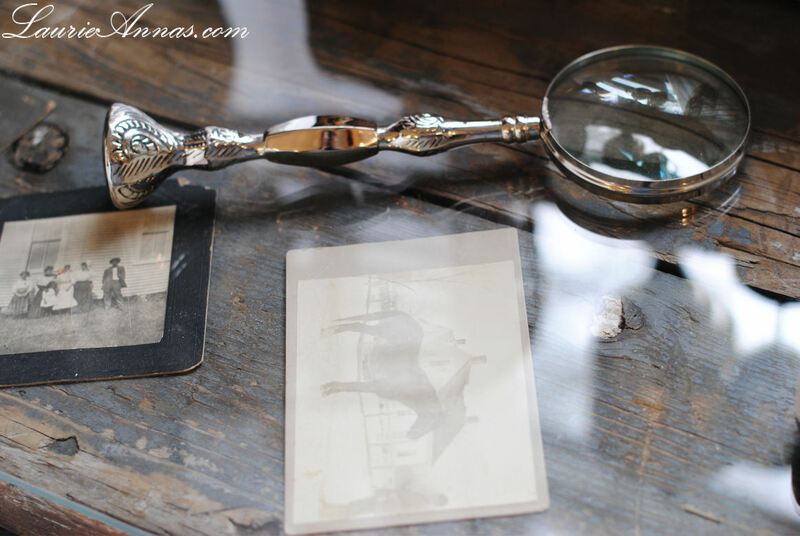 I enjoy sharing our little farmhouse with you and have a large supply of projects lined up for future posts. I'm currently working on the living room and am taking it in a different direction! 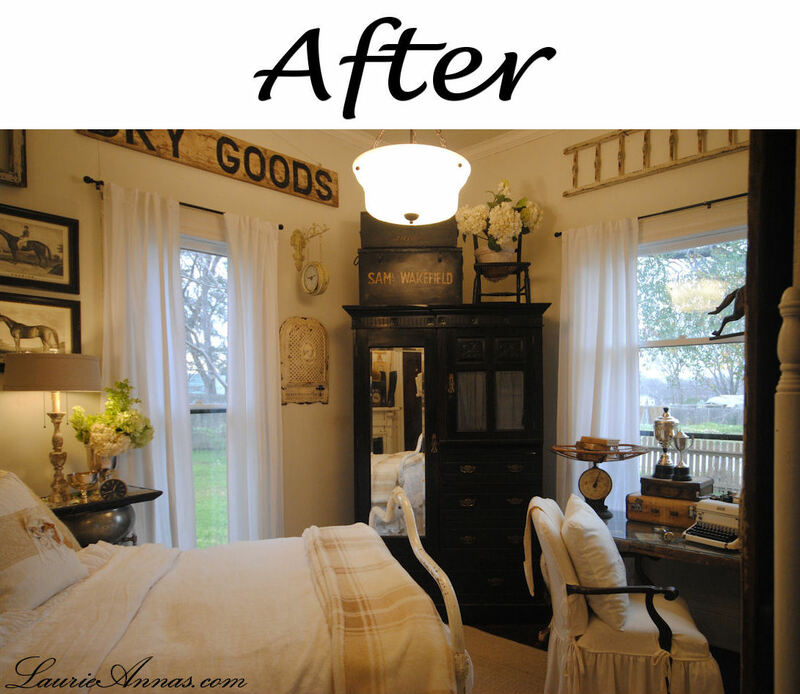 Last weeks bedroom reveal was much longer than I had anticipated so I saved the "before and after" photos for a later post. Aside from scads of wonderful comments, I also received loads of emails with specific questions about the room. I've answered some of them below. 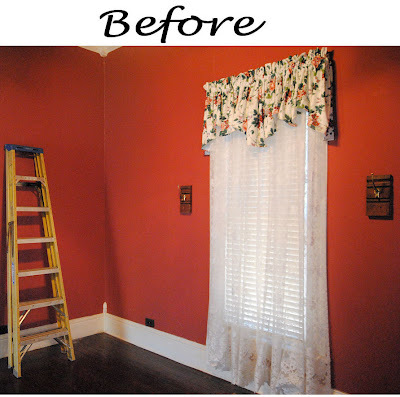 What paint colors did you use for this room? Did you custom make the bedding? No, the bedding is a mix of several different lines that I carry in my Shoppe. 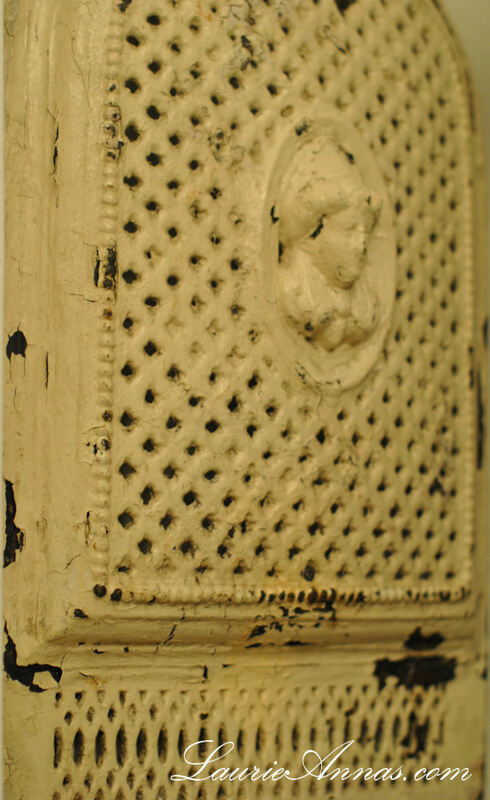 Since the color of all the bedding is whites, creams, and tans, mixing up the textures and shades instead of keeping it "matchy matchy" gave it more depth and the feel of being collected over time. Is the ceiling painted a different color than the walls? No, the ceiling color is the same color as the walls, but the walls are satin finish and the ceiling is flat. The difference in the finish and the lighting makes it look like a different shade. Where did you get the curtains and curtain rods? 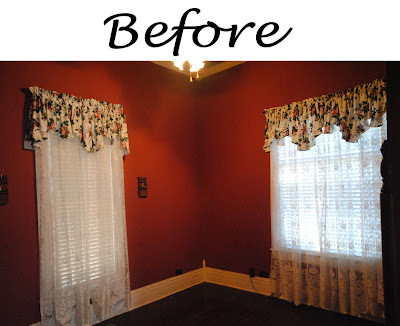 I sell the Farmhouse curtains at my Shoppe, and the curtain rods came from Wal-mart. Are the bed and desk antique, and are they for sale? Yes, the bed is an antique and the desk is a repurposed piece made from an antique stable door and antique iron sink legs. Are the horse prints for sale and are they old? The horse prints are reproductions, I found them a couple years ago and carried them in the Shoppe for a while. They have since been discontinued, but I'm trying to get my hands on more. How did you hang the barn door? I will share all the details including "how to" photos in an upcoming post. Hubster is reluctantly helping me with the post....blogging is not his thang! 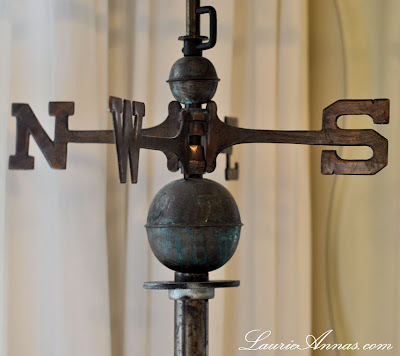 I'm linking up over at Vintage Inspiration Friday! This bedroom is beautiful. 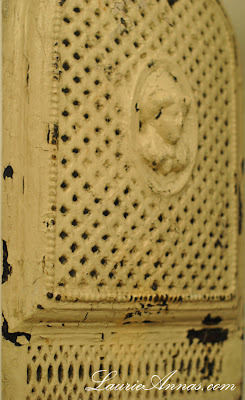 I've been looking for a few ideas for my farmhouse bedroom... it's in need for an update... I think I'll steal a few of yours. Just absolutely beautiful! Thanks so much for hosting and I'm looking forward to hearing how you hung that door. Such a beautiful room...I can see why everyone is pinning it! 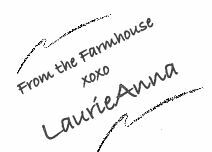 LaurieAnne ~ Thank you for hosting this party each week and also for sharing your gorgeous farmhouse. You are an inspiration to me and I'm sure to many others. You are so right about being able to share the things we are passionate about with each other ~ it's a wonderful thing! That guest room is fantastic, that's all there is to say! I could stay in forever! My hubby and I are color people, we like color in our home. BUT...this bedroom almost makes me want to try a room in white, a bedroom anyway. Beautiful! Wow, what a difference. The before was certainly a bold color compared to the white. 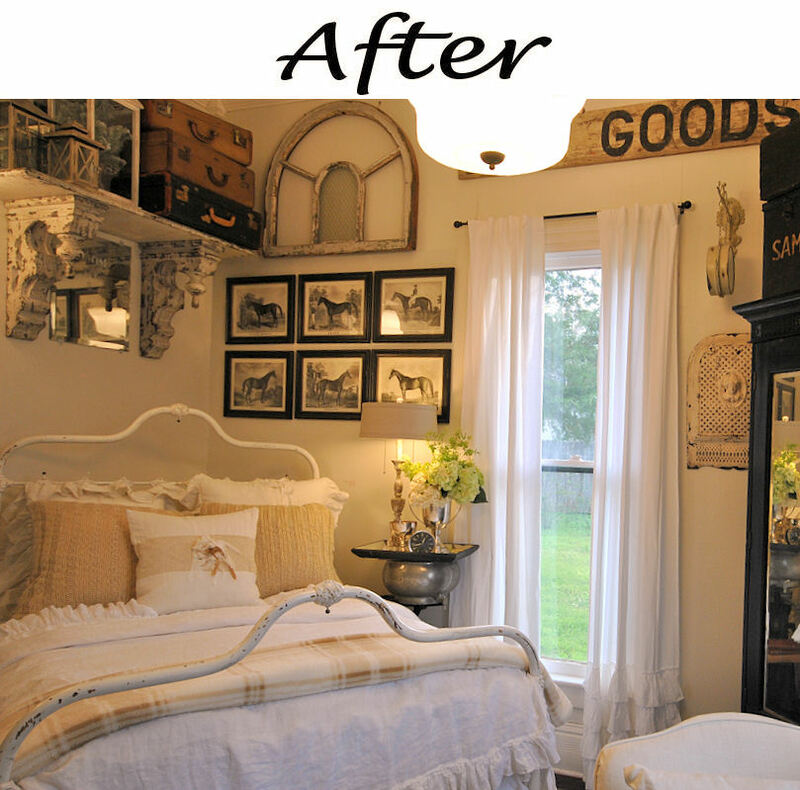 The after is just fabulous and so fitting for a farmhouse. Lovely!!! the image of your vintage photos on that aged wood table took my breath away. i could stare at it forever. bravo. 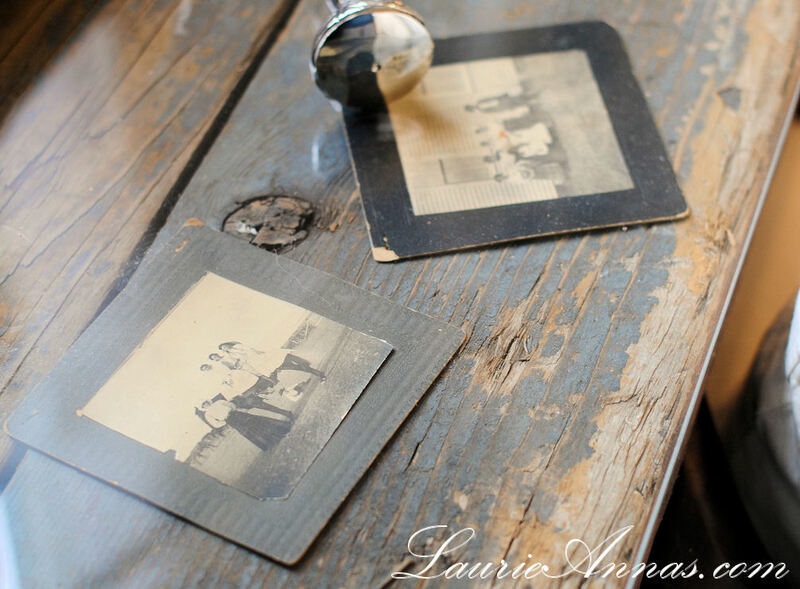 I <3 the antique ladder over the window...your full of beautiful ideas :) Thank you for sharing! The room is beautiful! I'm going back to take another peek. Thank you for hosting such a fun party. This is my first time joining. Thank you! Very pretty, Laurie Anna! You did a fabulous job! 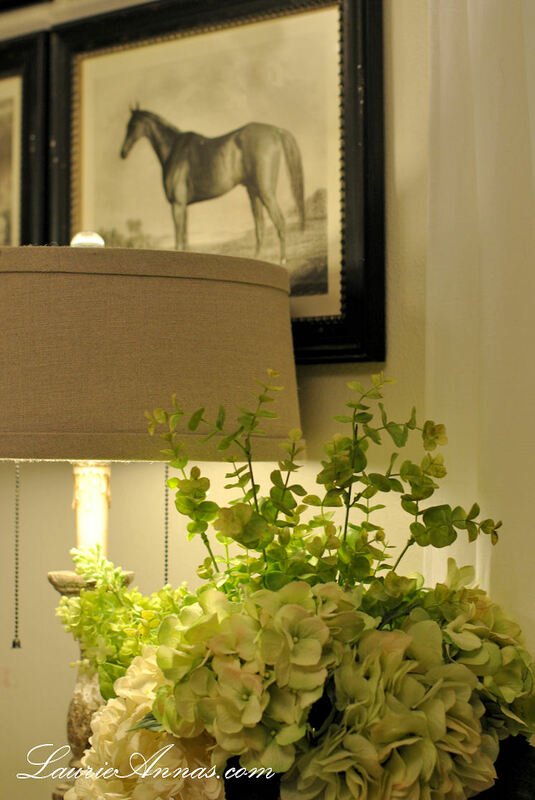 It looks light and airy and feminine! I would pin it, too! the creativity that went into this bedroom makeover is over the top.....gorgeous and so gorgeous! A beautiful room! Thank you for hosting! Thank-you so much for having this link party. Your farmhouse is gorgeous & I love your bedroom -- very peaceful. Love what you did with your bedroom! Thanks for hosting. Your bedroom is outstanding. So many interesting and unique items so well done in your space. Thank you for hosting!...I am looking forward to how you hung those doors! Your new bedroom looks fabulous! I would like a makeover like that for my bedroom! Thanks for hosting! 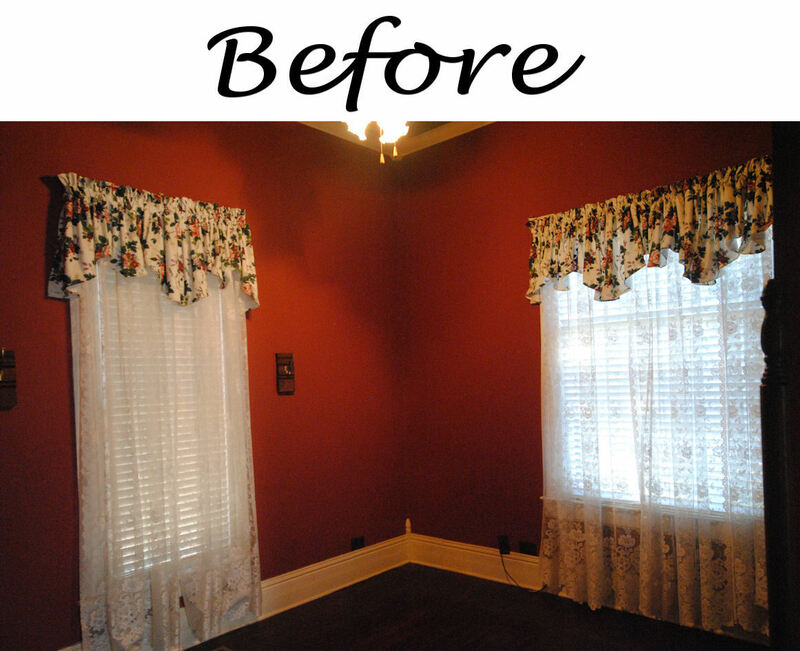 I can totally see why you received the overwhelming response to your guest bedroom...it's stunning! Totally inspiring too! Thanks for hosting and hope you have a great weekend. Take care. Gorgeous room, I would love to sleep there. Linked up, and thanks for hosting. What a transformation! I too like the name steamed milk. Then again all of my paint colors are named after food...!